Whenever you meet with accountants or financial planners, they want to know your overall portfolio. If you are or have a college bound student, you need to know the details required in filling out the FAFSA (free application for Federal Student Aid) form. You manage everything but your spouse has no idea of records or holdings; or your spouse manages all the records and you have no idea. Protecting against severe consequences Identity Theft attempts. For additional information, see Understanding Real Identity Theft. This is more than simple credit card fraud. Learn from a victim’s perspective on precautions you can take in order to rapidly respond and minimize losses. Avoiding the loss of Abandoned Property via Escheatment. What happens when you lose or forget to cash a check? Did you accidentally forget about an old insurance policy or bank account? Most importantly, did you know you can get it back? For additional information on Unclaimed/Abandoned Property and how to recover it, see our Understanding Escheatment and Recovering Abandoned Property. You would like your children, partner, custodian, Power of Attorney (POA), or Estate Executor to have a solid grasp of your belongings. Have you ever served in the role as a Power of Attorney or Estate Executor? Have you been involved or impacted in settling an estate or caring for someone seriously ill? Then you probably already know that during these critical times, you’re often faced with a scavenger hunt to find critical information. It’s better to be prepared for the unexpected. Also think further about Digital Considerations – We are all First Generation in using personal computers. An issue that hasn’t come into the forefront is technology from your survivor’s perspective. It’s hard enough for you to remember the accounts and passwords for your online shopping, your electronic banking and automatic bill payments, direct deposits/pay stubs, investment accounts… But what if you were incapacitated – how can you possibly expect others to find all of this information and manage your affairs? 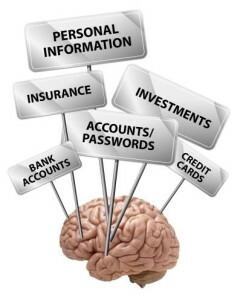 So in conclusion: When was the last time you Backed-up Your Brain? Now that you’ve convinced yourself of the importance of organizing information, it’s time to get started by remembering three things: What, Where, Who. For additional information on this topic, see our Organizing Primer. If you do nothing else, at least prepare basic lists manually, and let your family know the location. But clearly, it might be beneficial to consider a service such as MyLegacyBackup to guide you through this task, so you can organize your critical financial and personal information into one secure and centrally accessible solution.